Last October, my colleague Chris Breen compared four streaming music subscription services: Mog, Napster, Rdio, and Rhapsody. Before then, I’d never considered paying to, as Steve Jobs has called it, “rent” my music. But after talking to Chris about it while editing his story, I was intrigued enough to take the plunge and give a subscription service a try. For a variety of reasons (which I’ll get to later) I decided to go with Napster. I signed up at the beginning of November for a year of access, and wanted to share my experience—both the good and the bad—of using the service for the last four months. Although there are definitely limitations to streaming music, there are a lot of things about it that are pretty cool. High quality Before anything else, it’s important to establish that Napster offers very good streaming quality. Audiophiles might pooh-pooh the whole thing, but in a world of compressed MP3 and AAC files, it would be hard to tell the difference between those local files and Napster’s streaming counterparts. Better than previews Digital download services like the iTunes Store or Amazon.com offer 30-second (or, added recently, 90-second) previews of songs they sell. While that’s better than nothing, it’s really not long enough to give you a real sense of the song and whether it’s worth your hard-earned cash. Often times, I’ll hear about a new song or artist from a friend or because they recently won an award, say. With Napster, I can (in most cases) listen to complete songs instead of just short previews. My Napster playlists include lots of albums I wouldn't otherwise purchase or listen to. Expanded musical horizons Building on the previous point, Napster lets me listen to music I’d never buy, and therefore probably never hear except in passing. That opens me up to lots of new (or new-to-me) music. Saves me money Many times, I’ll buy an album from the iTunes Store or Amazon, listen to it once—and then never listen to it again unless a song pops up when I’m shuffling through my music. Just like watching a crumby movie streaming from Netflix, I can feel knowing that even if it’s not a good album, I didn’t pay anything extra for it. Good Pricing Speaking of prices, I signed up for a whole year of Napster plus mobile access for $96. That comes out to $8 a month, which is less than buying a single album from the iTunes Store. That gets me unlimited streaming to my computer, plus mobile access (more on that shortly). You can also choose to pay $10 a month, billed monthly or quarterly. For the standard Napster account, which eschews mobile support, it’s $50 a year, or $5 a month (billed monthly or quarterly as well). I still do buy some music—mostly live music that isn’t available any other way, or albums I know I’ll want to play over and over again (kids music, for example). And it’s worth noting that Napster also sells music. 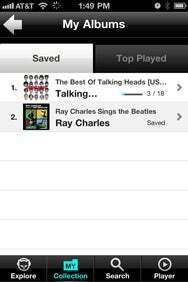 Downloading albums to my iPhone using the Napster iOS app. iOS support With a Napster plus mobile access account, you can also enjoy Napster on iOS, BlackBerry, and Android devices. The iOS app, while not universal, works on any iPhone, iPod touch, or iPad running iOS 3 or later. With it you can search for music, see new releases, and play music. But the best part is that you can download songs, albums, and playlists to your iOS device to listen to offline. Squeezebox support At home, I listen to a lot of music in the family area using a Logitech Squeezebox Radio ( ). When choosing a streaming music service, it was very important to me that I could listen to it not just on my Mac or iOS device, but also from the Squeezebox. That device supports Napster and Rhapsody. Now, lest you think me a lovestruck fool totally enamored by Napster, I do have several complaints. Web-based player isn’t great My biggest problem with Napster is how you listen to it. There’s no desktop application, so everything is controlled through a (Flash-enabled) Web browser. The interface is rather ugly, and although you can create playlists or add entire albums to the playback queue, there’s no way to control anything without mousing and clicking. If you enjoy using keyboard shortcuts with iTunes, say, you’ll find doing everything in a browser seriously frustrating (or at least I do). Napster also separates playback control into two separate browser windows. You fiddle with the queue and play/pause/switch tracks via the main window. But there’s also a small Audio Handler player window that launches when you begin playing something new. Closing it stops your music and clears you queue. So the idea is that if you (accidentally?) close your main Napster window, music will continue to play. But once you close that main window, there’s no way to see your queue, pause playback, and so on. Connect to Napster again and you won’t see any songs in your queue. Also, when you click to reveal the queue, it pops out from the bottom of the window and covers almost the entire interface. Plus, the queue doesn’t show you track lengths. In other words, somewhat of a mess. Without a new releases section, you're stuck with the Featured Music layout. New releases are hard to find When I visit Napster on a Tuesday, I want to know what new albums were released on that day. Unfortunately, there’s no real new releases section. If you go the Featured Music page, you’ll see a big list of recent albums, sorted by date within each genre, but there’s not delineation between them. (The iOS app shows you the same list of albums, but oddly calls it New Releases.) You can click on individual genres from a list on the left of the screen, but you’ll only see a few albums for each, and only some were released that week. And in any case, there’s no way to see, say, all the albums released on a certain date. Amazon, by contrast, provides a New & Future Releases page that show releases for the last three Tuesdays, plus upcoming MP3 albums that will be available (along with the exact date). Purchase-only albums Although most content is available to stream (that is what you’re paying for, after all), some albums (or specific songs within albums) are purchase-only. In that case, you’re limited to a preview that’s no better than the iTunes Store or elsewhere. But the bigger problem is, there’s no way to tell what albums or songs have such restrictions until you look at each album. I get that Napster can’t offer all tracks for streaming, but the service should make it clearer to users which albums/songs fall into that category. Downtime Like any streaming option, if a service faces technical problems or downtime, you can’t use it. And in the time I’ve been a Napster subscriber, the service has suffered several outages, extended maintenance periods, as well as a few instances of Squeezebox connectivity problems. And the site has no status section (at least none that I could find) that shows downtimes or other problems. The only information I’ve been able to get is via the company’s Twitter account. In general, I’ve been pretty happy with the content and features I get from Napster (especially for the price), but the interface and navigation could be a lot better. At this point, I’m not sure if I’ll renew my subscription when it runs out later this year, but either way I’ll have enjoyed and exposed myself to lots of music that I otherwise wouldn’t have. And that’s worth it to me.